Saving 'Brooklyn Nine-Nine' Was Business, But The Love Of It Is Real The roller-coaster experience of watching Fox's cop comedy knocked off and then revived had a lot to do with boring business concepts. But the people who love it desperately have good reasons. 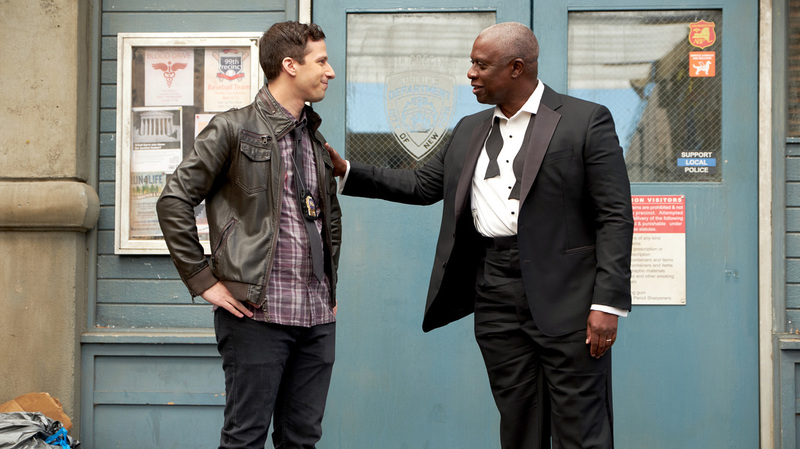 Andy Samberg and Andre Braugher in Brooklyn Nine-Nine. Consider the recent case of the police comedy Brooklyn Nine-Nine, which was canceled by Fox on May 10 and picked up by NBC on May 11. The outpouring — or the wailing, or the agonizing, or whatever term you want to use — seemed to startle a lot of people who didn't have it on their list of cult shows. Fans including Lin-Manuel Miranda and Guillermo del Toro expressed their dismay on Twitter, to say the least. But nothing comes back to life in only a little over 24 hours because of an unanticipated Twitter explosion. When you read about the process of getting the show picked up, it's clear that those conversations about a new home for the show were starting before Fox announced the cancellation. They have more to do with boring things like ownership and who gets the revenue from various viewing habits than they do with an orchestra swelling as an NBC executive stands up and says, "Dammit, I can't let them take this show away from loving fan Mark Hamill! Get me the Benevolent Rescue Department on the horn, pronto!" Bringing shows back is a business decision, and business decisions are often both boring and opaque. What's more interesting is seeing cult-show passion for such a traditionally structured program. The kinds of comedies people attach to at this level are often a lot more offbeat and niche-y than this — they're sci-fi, or they involve complex mythologies. Or they're like Community, which super-served fans with heavily referential, often experimental episodes that got weirder as the series progressed. Brooklyn is not like that; it's a very silly, very big-hearted ensemble workplace show. It's just very good at it. So what are they doing right that's so beloved? Evolution. Early episodes of B99 were about the slick and cocky Jake Peralta (Andy Samberg) feeling the pressure of his new, stricter boss, Captain Raymond Holt (Andre Braugher), who — for instance — wanted him to wear a tie. Jake's partner, Amy (Melissa Fumero) mostly resented him in the way rule-followers always resent rule-breakers. Elsewhere in the squad, Charles Boyle (Joe Lo Truglio) was in endless pursuit of Rosa Diaz (Stephanie Beatriz), and he would not take no for an answer. Over time, affection between Jake and Holt proved to be funnier than conflict, and Samberg is much better as a guy who wants approval than he is as a smug jerk who thinks he knows everything. (Writer Nichole Perkins spoke eloquently about the evolution of the Jake/Holt dynamic on Twitter recently.) So both of those characters have changed. Similarly, a comedic running gag about a guy at work who won't listen to a colleague say "no" to romantic advances — even if the guy is such a sap as to seem harmless — is off-putting to a lot of people, and indeed, Boyle's pursuit of Rosa went away. In fact, one reason the initial cancellation of the show felt so painful is that it's continued to change and it didn't seem finished. B99 had great fun when the writers were first experimenting with letting the deadpan Holt, played with such commitment by Braugher, show a glimmer of silliness. For instance, Holt once participated in a simple guessing game with the squad about why Amy was late — and when he turned out to be right, he yelled, "HOT DAMN!" It was delightful, because it was such a surprise. But you can't push that button too many times, or it stops working — after you've seen HOT DAMN!, you're less surprised the next time he goes for a gag. So now, they draw him less as a man who never breaks and more as a man who's exploring a different side of himself with varying degrees of success, as when he came strolling into the squad room in a red bowler hat. Even Jake and Amy's relationship, which predictably became a flirtation, didn't stall. They spent a reasonable amount of time flirting, then they started dating, then they got serious, and now — as of Sunday night's season finale — they're married. Every stage of that evolution has had its own jokes and its own dynamics. The same goes for Jake and Charles: at first, it seemed like Charles was a weirdo who insisted he was Jake's best friend and Jake tolerated it, but now, he actually is Jake's best friend. On TV, upheaval can look desperate, but evolution feels confident — it means that you believe your writers and your cast can do new things and relate to each other differently. It's one of the reasons they're five seasons in and aren't carrying that weight of "they seem about done" that often starts to haunt shows much earlier than this. A calling card. Plenty of shows have cold opens — little bits that happen before a credit sequence or a title card. But nobody does them better than this show right now. The theme music starts with a blast of horns, and they've figured out how to write and edit opens so that they slam into those horns in an effective way. As much as anything, they're a feat of editing. One genius example: Charles told Jake that he ... well, describing it is hopeless. Watch it on YouTube. The bulk of that bit, after Charles says he got a "Dianne Wiest infection" from watching Bullets Over Broadway, as Jake stares at him, is almost entirely an editing joke and a camera-zoom joke, and then Charles can't help yelling, "LIKE YEAST--" and then the music cuts him off mid-sentence. If you think about it, that joke has no possible ending if it doesn't end there. The joke is really Jake's cold stare and the fact that Charles plows right through it. If Charles finishes the phrase, it just plunks to the ground and it's instantly less funny. But when you interrupt his gleeful exclamation and crash into the intro, into those horns, it suddenly works. Sometimes, the cold opens are related to the plot, but often, they aren't. And they usually make sense even for people who don't know the show, as when Jake recently held a very unorthodox lineup. Inclusion. As befits a show that takes place in New York City, B99 has always had a more diverse cast than many network shows, and that's given them options. As Perkins pointed out in her thread, Capt. Holt and Sgt. Terry Jeffords (Terry Crews) have talked about being black cops — and very different ones — in the environment the Nine-Nine is operating in. That couldn't have happened on the many shows that don't have two black men playing two very different black cops in the first place. Amy and Rosa are both Latina, but that exists more as character than plot; they occasionally reference a commonality that transcends their opposite personalities, but for the most part, they don't talk about it; it's just a fact. Maybe the best example of how inclusion (in character and writing) works for the show comes very early on, when Holt talks about having been an out gay black cop in the 1980s — that's where his steely fearlessness comes from. It's not a character detail that's present for its own sake, but it's not invisible, either. Just like issues with his dad are part of Jake's history, having been gay in the NYPD for decades is part of Holt's. And while it is a clever inversion of a lot of tropes about stoic, tough cops, it's also a well-formed back story in its own right. And when Holt's husband Kevin (Marc Evan Jackson) admitted to Jake that he was unfriendly because he had adopted a policy of hostility to police officers because of the force's early treatment of Raymond, that made sense. It had weight. Tonal control. When B99 was first announced, a lot of critics — and I include myself — wondered whether it was really possible to make a comedy about police officers who would be investigating a lot of crime, including homicides. There have been other cop comedies, but how do you wring comedy out of murders? As it turns out, the answer is to make the murder parts as ridiculous as possible. It might be counterintuitive, but if you tried to write the actual cop scenes (the ones that involve serious crimes) from a point of view of more earnestness, you'd get poor taste. Almost always, the comedy is at its broadest point whenever the squad is actually dealing with a crime. The B99 criminals tend to be buffoons, if you see them at all. What is heartfelt — which is a lot — takes place among the members of the squad. The paternal attitude Holt has toward Jake, and Jake's gratitude; those things are heartfelt. Jake and Amy's relationship, obviously. Rosa and Jake's friendship. Terry's love of his family. Those things are played with a ton of feeling. Generally, the cases aren't. The tonal tightrope they're often walking works because everyone involved is in sync with the kind of ragged, almost sketch-like feel of the show. The camera work features a lot of handheld shots and punchy little zooms. The dialogue is heavy on absurdist jokes and often moves like a shopping cart barreling downhill, often seeming in the best way to be just barely under control. So no: shows don't come back from the dead just because people scream. And thinking they do will lead to a lot of unnecessary screaming. The reason shows find second homes more easily than they once did isn't necessarily because someone else figures out something that the old place didn't know, or appreciates the show where the old place didn't. Brooklyn Nine-Nine is financially a different proposition at NBC than it was at Fox — NBC owns it; Fox was just airing it and making money from the ads. (Read more about this arrangement from Joe Adalian over at Vulture.) NBC can make money off it in different ways than Fox can. It's not all quite as magical as it felt. But if this had to happen to somebody, if the business considerations had to come together to save a show in this ridiculous and dramatic way, it's nice that it's such a good show. Besides, who wants to upset Guillermo del Toro?